Celebrate food – how to cook, what to cook and where to eat – with PBA30! Preview the new cooking shows airing weekdays from 12 to 1 p.m., like "America’s Test Kitchen" and "Sara’s Weeknight Meals," and discover recipes from favorite local restaurants like The Flying Biscuit and South City Kitchen. Step-by-step instructions on how to make favorite recipes from local restaurants. Tune In Weekdays at 12 p.m.
and a new style of cooking. 12 p.m.Taste of Louisiana with Chef John Folse & Co.
PBA30 host Alicia Steele shares the recipe to her favorite Spanish dish, her father's paella. WABE 90.1 "City Lights" host Erin Wright recalls a sweet treat that reminds her about her time abroad. For WABE 90.1 “Closer Look” host Jim Burress, a special boozy dessert brings back memories of home state. 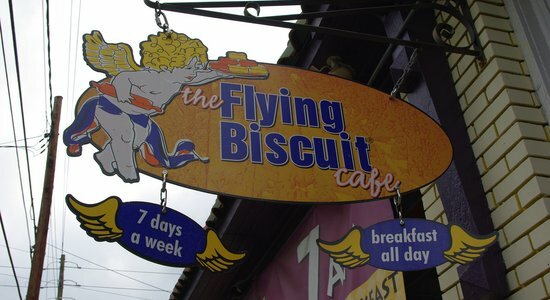 "Hush Puppies And Cornbread Move Over, King Biscuit Is Here"
A talk with two area biscuit-makers, the founder of Callie’s Hot Little Biscuit and the executive chef of Flying Biscuit Café. "Chef Kevin Gillespie’s Quest To Save Southern Cooking"
How local chef Kevin Gillespie is resuscitating what he calls “authentic Southern cuisine." "Atlanta: A Food Town That's Come Into Its Own. Again." The New York Times has given Atlanta its blessing as a food town that's come into its own. "Atlanta Embracing The Revival Of Public Food Markets"
How Atlanta's responding to the new appetite for public food markets.